Oracle (www.oracle.com) offers various products and services such as database services, application services, server and operating systems software, virtualization and cloud computing services, enterprise resource planning solutions, storage and networking services , and many more.Oracle has several certification tracks that one can choose, based on the area of expertise. 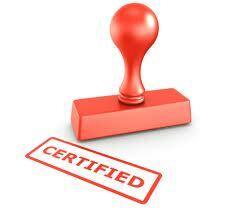 Here is a list of few certifications that you can pursue from Oracle. Check out my article on Parsi Times Newspaper dated 8th December 2012, on Important Tips for Resume Writing. Resume is one of the key necessary elements required during job search. Many people get overwhelmed and frustrated when asked to write their resume. Here are some key points that will help you to successfully prepare a compelling and forceful resume. Use a basic font type such as Arial, Times New Roman, Calibri, or Verdana. Font size of 11 points or 12 points is easy to read. Capital letters, and features such as Bold, Italic and Underline should be used sparingly. Employers don’t have the time and patience to read long paragraphs of information. Thus, writing your resume in a bulleted format will enable the manager to scan your resume quickly. Bulleted job descriptions are faster to read than long paragraphs. Make sure that your contact details are clearly listed on your resume. If you have more than one pages of resume, then it would be a good idea to display your name and contact details on all the pages. Contact information should include your full name, address, zip code, mobile number, home phone number, and email address. Most employers and recruiters prefer a resume that is one to two pages in length. The shorter your resume, the better. Action verbs help in clearly communicating your achievements, accomplishments and skills. Positive action verbs or power verbs make your achievements sound even more impressive. Few action verbs are: accomplished, administered, managed, enforced, lead, analyzed, rectified, formulated, illustrated, and many more. Depending on your skills, work history and job requirements, choose the best resume format. You may choose a chronological, a targeted, a functional, or a combination resume. Your resume should be tailored as per the job description. The easiest way to find keywords for your profile is to use a job search engine (such as Naukri, Monster, etc.) and search for job listings. This will make your resume match the given requirements, and will increase your chance of getting an interview call. This is a time consuming process, but it is worth the time and effort. Writing a targeted resume will highlight the skill and knowledge you have that is pertinent to the job you are applying for. Edit your resume according to the job description. Take the keywords that appear in the job posting and add them in your resume. Prioritizing the content of your resume is very crucial. Make sure that you list the most relevant and important work experience first. Put yourself in the employer’s position, and decide whether the information in your resume makes you a worthwhile candidate for the given job post. Objective is the first thing on your resume after your contact details. A good objective can convince the hiring manager, that you know what you want to do and achieve. If you are applying for a specific position in a company, your resume objective should match up with the position you are applying for. Your resume should not contain pronouns such as “I” and “Me”. Resume writing is a form of business writing, and thus use of pronouns should be avoided. If you have a gender neutral name such as Kiran, Viral, Ashwini, etc., make sure you include prefix (Mr. /Ms. /Mrs. ), so that the employer will not get confused about your gender. Avoid using expressions like “Responsibilities included”, “Duties included” or “Responsible for” in your resume. Describing your professional achievements and accomplishments are more important than listing your roles and responsibilities. A silly email address can make the employer think that you are not serious in your job. Avoid using unprofessional email addresses, such as cooldude@xyz.com, partygirl@xyz.com, crazyforbeer@xyz.com. Use email addresses that contain your name. White Space is the blank area of your resume page where text is not printed. Make your resume clutter free. Avoid using unnecessary dates, parentheses, articles (a, an, the), and statements such as “References: Available upon request”. Before sending your resume to the employer, proofread your resume. Spelling mistakes, punctuation errors, and grammar mistakes create a negative impression. Also, have a friend or two read your resume to provide second opinion. If you are having trouble writing your resume, then you may reach out for professional help. Professional resume writing and editing services can help you craft your resume from scratch. National Institute for Fashion Technology (NIFT) is an esteemed institute offering design, technology and management courses at graduate and post graduate level. All eligible candidates will have to appear for a written entrance examination at the Examination Centres opted by them. NIFT entrance test is designed to test the knowledge, skill and aptitude of the candidates for the programme opted.